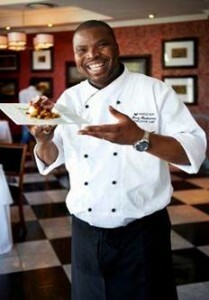 Johannesburg – Africa’s most awarded airline, SAA, welcomes Tsogo Sun’s Executive Chef Benny Masekwameng onboard to upgrade its premium and regional onboard menu. The signature dishes of Benny Masekwameng, Executive Chef of the Tsogo Sun group and celebrated MasterChef South Africa judge will be introduced in all of SAA’s international premium class and regional flights. “We are excited about our partnership with seasoned Executive Chef Benny Masekwameng and are confident that his expert advice on our premium class menus and menus on our regional flights, will delight our customers’ discerning palates,” says Manoj Papa, SAA’s Acting General Manager: Commercial. In keeping abreast of global food and beverage trends, SAA refreshes its food and beverage menu annually. Each SAA customer is offered a delectable menu selection, free of charge, which includes Halaal, Kosher and Vegetarian options.